You do not need a big fleet to have an afternoon of close racing and great fun at York RI Sailing Club. This was amply demonstrated at this year’s Round Holes Trophy, that took place in river conditions that were far from ideal and very challenging, even for the local teams. Heavy rain in the days preceding the event produced something of a flood on the day of the race, which submerged all the jetties and produced huge amounts of flotsam (not to mention the occasional tree! ), all of which streamed past the club house on a swirling current. After much sucking through teeth by the race officer it was decided that the wind was sufficient for a GP14 to be able to punch the current and that we could ‘manage’ without jetties. Three races were programmed back-to-back, thereby avoiding the need to attempt any more than one landing without trashing the boat! With lots of co-operation and even more friendly banter, all the boats made it safely onto the water without anybody being swept away. Up-wind was down-current and It was rapidly apparent that the trick in starting was simple: avoid being OCS! We also realised equally quickly that our friendly and massive iron bridge, that lay just off the leeward mark, had become a no-go zone (well, ‘no go’ if you wanted to keep your mast in your boat!). Race one got away cleanly in spite of a small island of logs and shrubbery joining the fleet just before the start. The Old Yellow Boat grabbed an early lead and never looked back, leaving Jens Kuhn and Pete Craggs to battle it out for second and third places. Pete, a seriously good Series Two man, had borrowed his mum and dad’s much-loved plastic Series One but he seemed strangely baffled by its stern sheeting and lack of string! As a result Jens and Rachel sailed their ‘shed’, complete with adopted frog mascot, into a great second position. 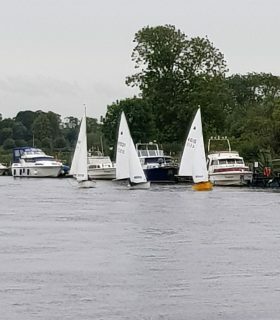 Race two proved a clear win again for Steve and Kevin in the OYB but this time Pete and Phil took second spot, while Jens and Rachel still managed a creditable third. Race three looked like being a much closer affair but in the end the same three boats prevailed and the finishing sequence matched that of race one, giving Steve and Kevin a clean sweep in the Old Yellow Boat. The return to base was tricky, some opting to trust in a leap of faith when they judged themselves to be adjacent a jetty (not easy if rudders and centre boards are not to be crashed on submerged structures), while others hailed the shore for their trollies and sailed their boats onto them in the narrow slip way. Fortunately nobody drowned and all made it safely into the club house for the excellent home-made cake and well-earned mugs of tea. If you missed the fun this time, look out for the 2019 fixture and come and have a go. You do not have to come with a super boat, it just needs round holes in the back!